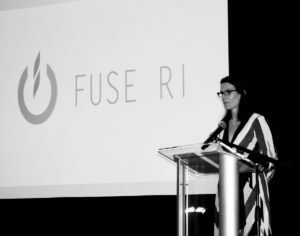 On November 9, 2017, we officially welcomed our Cohort 4 Fuse Fellows at the 2017 Fuse RI Induction Ceremony. The Fellows were celebrated by family, friends, colleagues, district leadership, Fuse Fellow alumni, and Highlander Institute staff. Sarah Rich, Cohort 1 Fuse Fellow and Lead Teacher for Squiggle Park, closed out the evening with a keynote address. Sarah has been a strong advocate for blended and personalized learning since the movement began in Rhode Island. 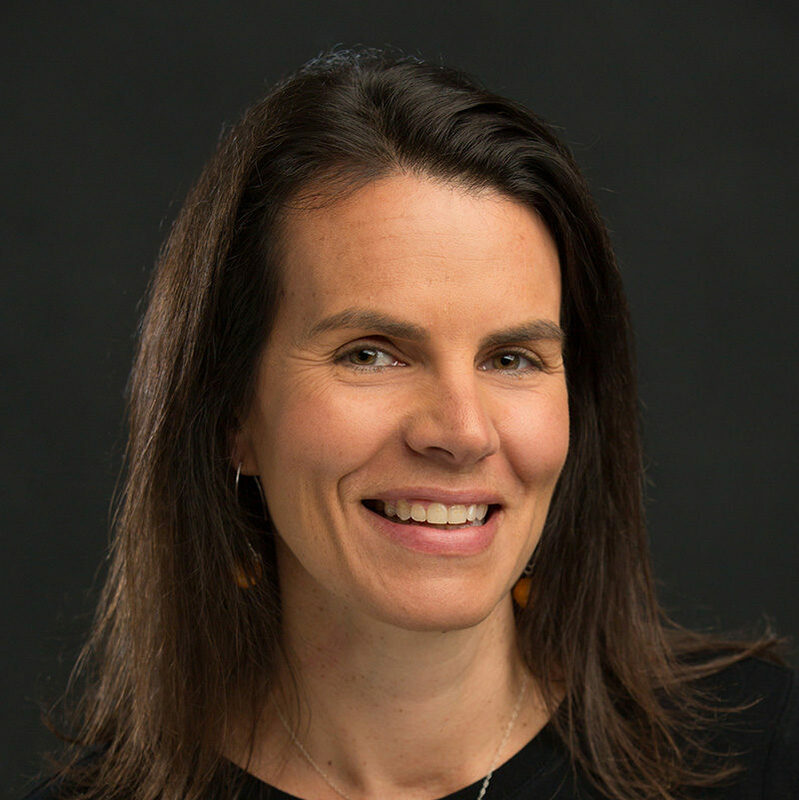 She has taken on leadership roles, collaborated with educators all over the state and the country, and has always been thoughtful on the intersections between educators and edtech entrepreneurs. 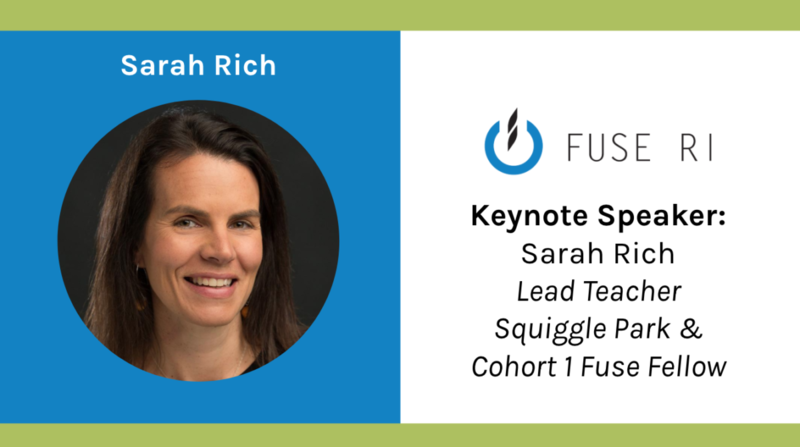 Thank you Sarah for your lovely keynote, and thank you again to all Cohort 4 Fellows and Districts who are officially starting their Fuse RI partnerships. Congratulations! I am thrilled to have the chance to welcome Fuse RI’s Cohort 4 personally. It’s so exciting to see you all sitting before me. It seems like just yesterday Highlander Institute was being launched. I was with Shawn when he received the call that the funding for Fuse RI had gone through. I can still remember his face lighting up when he heard the news. At that time I don’t think anyone realized what an influence Fuse RI would have on the blended learning community. Speeding ahead to this year’s iNACOL conference in October, I loved being able to witness Shawn Rubin receiving iNACOL’s Outstanding Individual Contribution to Personalized Learning Award. My how far Shawn, Fuse RI, and Highlander Institute have come! As I look around this room and see more educators joining this incredible movement, I can’t help but think about my own educational experience. I was a struggling student, with low confidence, and learning disabilities. I studied regularly and still did poorly on tests; I often felt like teachers didn’t understand me. What a difference blended and personalized learning is making for students like me today. Finally, students are in charge of their learning and can go at a pace that is just right for them. Gone are the days of teachers lecturing at the front of the room to disengaged students. Over the next two years, each one of you will impact administrators, teachers, and students with your blended learning expertise, making more 21st century classrooms bloom throughout the state. The journey you are about to embark on will open doors you never even considered opening. Your connections of like-minded educators will increase too. You now have a new family, the Highlander Institute Fuse Family, a team of experts passionate about raising the bar in classrooms. Our family keeps on growing, and we are so glad you all are now a part of it. In her keynote address, Sarah Rich mentions her multiple roles as a founding faculty member, a blended learning advocate, a Fuse Fellow, and an edtech specialist. I am a founding faculty member of Paul Cuffee School here in Providence and an educator of 17 years. It was during my 12th year in teaching, when I felt I began to lose the spark I always had as a teacher. I wanted to find a new passion but wasn’t sure what that was. My blended learning journey began in 2012 when I attended a workshop at Highlander Charter School on iPads. Upon returning to my classroom, I began using my iPad to teach everything. I was blown away by how engaged my second graders were. I wanted to continue to take this further. I began thinking of more ways I could recharge and reinvent the learning in my classroom. I would meet with Shawn, Roshni, and a few others would to share ideas. Then EdUnderground was born: a team of like-minded educators exploring tech trends and sharing classroom resources. This continued to feed my desire to learn more. My favorite part of this journey was the one I took with my students. I remember telling them that I had been accepted into the Fuse RI Fellowship. I explained that they were a part of my team and that we would learn, experiment, and try new concepts together. Some would be successful and some would not. My students became more engaged, the classroom began to flow better, and suddenly I had second grade experts ready to coach fourth and fifth grade students and help make other classrooms come alive! My final Fuse RI project was on the importance of partnerships between edtech companies and teachers. Edtech companies need to consult teachers to create successful products. In 2015, I left the classroom to join Squiggle Park, an edtech company based in Halifax, Nova Scotia designing reading apps for Pre-K through second grade students. During my time at Squiggle Park, they have supported my passion for blended learning, recognizing that they are a just a small piece of the big picture. I’ve taught at edcamps in Canada, run webinars for educators around the world, worked with college professors and students on the importance of tech integration, and built valuable blended learning content for our website. One of my favorite projects was creating a Summer Teacher Program at Squiggle Park. Each year we hire ten educators to work with us during the summer to make the product even better. This past summer our own Cohort 4 Fuse RI Fellow Becky Jones was a part of the team. She’s fantastic by the way! It continues to be an exciting journey building connections and improving an edtech product while keeping my passion for blended learning alive. None of this would have been possible without my own Fuse RI experience. We all have different strengths- that’s the magic of your team. That first year I was paired up with Jess Geremia and Deb Ramm. We all brought different skills and forces to the group, and it made for a successful partnership. Each school and district is different, and each one of your experiences will be different. The advantage now is that everyone knows what Fuse RI can do for their school or district, we just have to show them how. Being in Cohort 1, we were the test dummies…four years later with Maeve Murray at the helm, things just keep getting better! We still have a long way to go in the blended and personalized learning movement. But we are headed in the right direction. It’s your influence that can encourage teachers to try something new, it’s your influence that can help administrators support their teachers taking risks to try new concepts, it’s your influence that will make student’s learning adventures like none they have experienced before. You are now a part of the Fuse magic! Before I end, I’d love to thank the Highlander Institute team for the incredible program they have built and for making it even better each day. We all wouldn’t be here without you! Best of luck Cohort 4, I can’t wait to witness the journey each one of you takes as a Fuse RI Fellow. Light that fuse! Cheers!